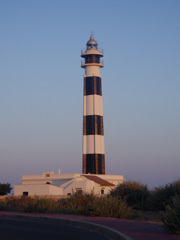 Tourism in Menorca. What to visit? - Ciutadella: Ciutadella is the second biggest town of Menorca, and has a beautiful old town that is all surronded by the "Contramurada", the walls of the old city. The town center has a main pedestrian area and you will find the arcades, popularly known as "Ses Voltes". The port of Ciutadella is very nice and plenty of bars, restaurants and clubs. - Naveta des tudons: This ancestor monument is located in the main road that goes from Ciutadella to Mahon. A "naveta" is a type of burial monument that is only found in Menorca. It was built with the cyclopean technique, with medium sized stones fitted together without the help of mortar. - Fornells: Fornells is located in the center north of the Island, and is known as a typical Mediterranean fishing village. The town is undoubtedly a pleasant and pretty place, with nice looking houses, with nicely decorated exteriors. Is recommended to walk through the town and to find the Torre de Fornells and enjoy the views from up there, and of course, to taste the "caldereta" (an extraordinary rice), in one of the restaurants that you can find there. - Mahón (Spanish) or Maó (Catalan): Is the capital of Menorca and is a small historic port town which was strategic military base for centuries. Mahon is plenty of interesting history, such as the typical windows of British colonial architecture. The large number of influences result in a old town plenty of interesting corners to discover, and some buildings to visit. 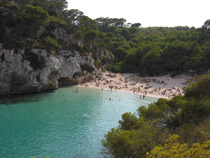 - The northern and southern beaches: Menorca has more than eighty beaches and each one has its own character. Many of the wilder beaches are absolutely untouched by man. On the south we could find long beaches of white fine sand and most of them surrounded by pine woods with rich vegetation.. On the northern coast, with higher rocky cliffs interspersed with hidden rocky coves the beaches tend to be smaller and to have red sand. Menorca is the balearic island with more beaches and coves and you can find there a wide range of different types of them. Here we suggest some beaches/coves that you must visit during your stay. 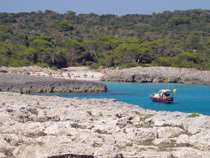 Menorca has a typical Mediterranean climate with long hot summers, the island has around 300 days of sunshine per year. The best time to visit, in terms of climate is summer, but be aware that July and August are very busy. Late spring and early autumn also experience fantastic weather.